Are all organs the same…. or are some different? 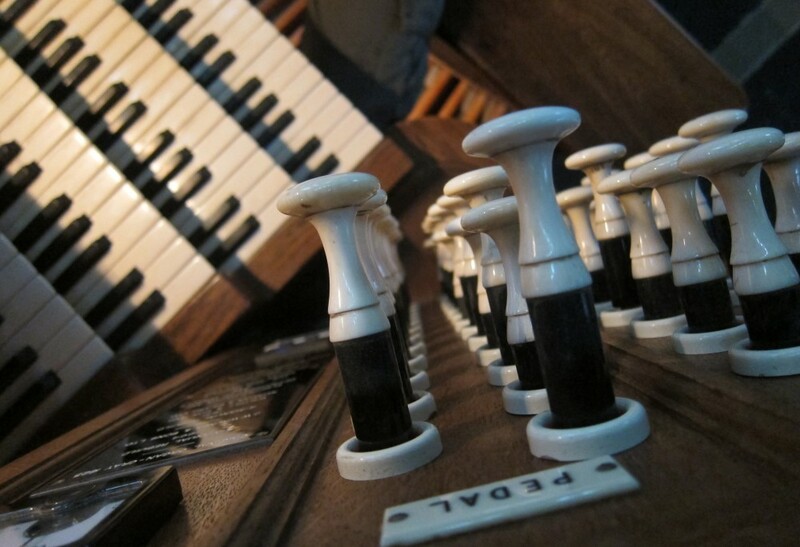 If ‘being an organist’ was all about just playing an organ, it would be fairly predictable, safe and uneventful! But, as most people who choose to follow this noble profession will know – uneventful it ain’t! Sometimes, I even get invited to the wedding reception. Many years ago a younger, slimmer and slightly gaunt version of stmarysorganist naïvely accepted the invitiation – in retrospect, I think the couple felt sorry for me and probably thought I needed a good meal!! So there was I, at a rather well-heeled ‘do’, sitting at an enormous circular table which was brimming with farmers and their families, who all knew each other, understood each other’s sustainable agricultural techniques, use of crop waste and animal manure, and conversations were flowing aplenty around the table. My chance to introduce the assembled bunch into my world had finally come. But at the crucial moment, images of the Atlantic City Convention Hall Organ became merged with the Thomas electronic I had learnt on at home – how could I begin to explain the glorious variety that we encounter with every instrument? To experience the wide variety of organs around, you need to go on a choir tour! This will inevitably throw up all sorts of instruments and places, one worth naming is St Bartholemew in Sitges – a venue of romantic beauty with an instrument to match. This organ was a totally unexpected gem (G Grenzing 1985), and I enjoyed this experience from rehearsal to the end of the concert! The only negatve was the abject pain I had when playing the ‘Trompetta en Chamade’ which were a row of horizontal trumpets perched within a foot of my head, and there was no means of protecting my ears from the head-shattering scream that came out of those pipes! ( I did manage to get a recording of ‘Danses et Estampes’ by Jan de Lublin from this concert – Listen to it here). One moment when the instument completely underwhelmed my overblown epectations was on a visit to a Cypriot convent, where with great excitement I discussed with our organ scholar, which great pillars of the organ repertoire we would play on this anticipated ‘tour de force’ of the organ world. There was no internet back then, so prior research had been limited to some fruitless letters requesting specifications. Once again, as with other tours, rehearsal time was almost non-existant, and the choir processed in as I found the ‘on’ button and selected with care a ‘churchy’ registration. What ensued was a variety of different buzzes at different pitches, all bound together with a constant droning hum of electrical interference of some kind. I managed to find a selection of noises on the Upper manual that were usable, so I played on them for most of the service. At a moment that I was to later regret, I bravely plunged my hands onto the Lower manual for some much-needed variety. And variety was certainly in evidence, as the third verse of ‘Let all mortal flesh’ was now accompanied by a ‘Bossa Nova’ rhythm section with automatic chords! It could be that some of the people attending that service could have been moved by this particular addition to a well-loved hymn, and if you were to visit the same convent now, you may find it a regular feature. But judging by the looks of imminent disfigurement that were being darted at me by the assembled throng – I very much doubt it. My voluntary was sensibly short, the organ scholar held the door open for me, as we both made an undignified dash for the coach after the service!